The European Championship finalist, pledging to tweak his approach in 2017 in a bid to hold his own amid a strong British middle-distance contingent as the world championships in London loom large, ran 1:50.22 at the Emirates Arena to surge clear of Stephen Mackay in second. Allan Hamilton surprised teenage prospect Cameron Tindle to win the men’s 60m in 6.77 seconds before making it a double success in the long jump while sprint hope Alisha Rees took the women’s 60m in a personal best of 7.59. Elsewhere, Jax Thoirs cleared 5.15m to take top spot in the pole vault, Grant Prenderleith took the 200m while heptathlon convert Jade Nimmo ran 8.87 secs for victory in the 60m hurdles. Meanwhile Olympic marathon runner Derek Hawkins made his return after five months on the sidelines with tenth place at the Antrim International Cross Country. The GB internationalist was 100 seconds adrift of Kenyan race winner Conselsus Kipruto with Andy Vernon the leading Briton in third. 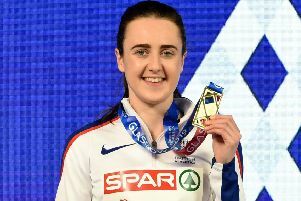 Morag MacLarty was tenth in the women’s race in Antrim with fellow Scot Steph Pennycook four places behind as Kenya’s Caroline Chepkocech Kipkirui romped to victory.